The Portland Press Herald is exploring the shift in vote among Republican state representatives on LD 6, the bill that would allow municipalities to decide whether or not they want to require their superintendent to live within the school district. This bill passed with a strong supermajority of votes in April – over 75% support in both chambers – but was just vetoed by Governor “School Choice” LePage. In theory, this shouldn’t have been a problem for the bill because a gubernatorial veto can be overridden by a 2/3 majority of legislators. This bill had far more support than that. However, here’s where politics steps in on our theories about consistency. 41 representatives changed their vote between April and May. 35 of those 41 were Republicans, who moved from supporting to opposing the bill. Since Governor LePage is the highest-profile Republican in the state, it is hard for Republican legislators to cross him without having reasonable cause to believe that negative consequences will follow. This bill wasn’t even a strongly partisan bill. Support and opposition initially seemed to have more to do with local preferences than party – southern Mainers of both parties tended to support it, while representatives from other regions varied more. Initially there were 8 Democrats and 12 Republicans opposed to it. Two of the four Independent (“Unenrolled”) representatives supported it and other two opposed it. Nonetheless, even on something as relatively non-partisan as the decision whether to allow municipalities to determine the conditions of their superintendents’ employment, the governor’s veto drives some Republican legislative vote-changing. Interestingly, as it turns out, the governor’s veto also drove some Democratic – and even Independent – legislative vote-changing! 5 of the 41 vote changes were among Democratic legislators, and 1 of the 2 Independent legislators changed his vote. All of those changes were moves in support of the bill. I hadn’t really thought about that kind of effect before looking, but I can imagine two causes for it. One is the governor’s unpopularity among Democratic voters. It’s possible that a legislator’s history of voting to override gubernatorial vetoes will be attractive to Democratic voters during the next election regardless of what the bill in question was actually about. Another possibility relates to vote-whipping or lobbying by particularly effective bill sponsors. If that was the case, we should see different patterns of Democratic vote-switching depending on the issue or legislators involved. 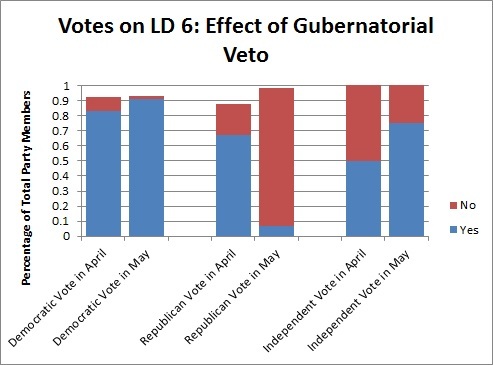 At any rate, as we get into a period of increasing chamber votes and the Governor warms up his vetoin’ hand, it will be useful to have some ways to visually represent the impact of gubernatorial veto on legislative decision-making. I am excited that the Press Herald is thinking about ways to represent this visually, but I think they haven’t quite got it right yet – right now they’ve spread the visualization across two different pages, which makes it difficult to compare them. I can completely empathize; it’s really challenging to figure out how to convey information in a succinct, compelling visual which also contains a lot of information. The votes don’t add up to the same number because different numbers of representatives were absent on each voting day. Clearly, the interesting story here is the vote-changing. 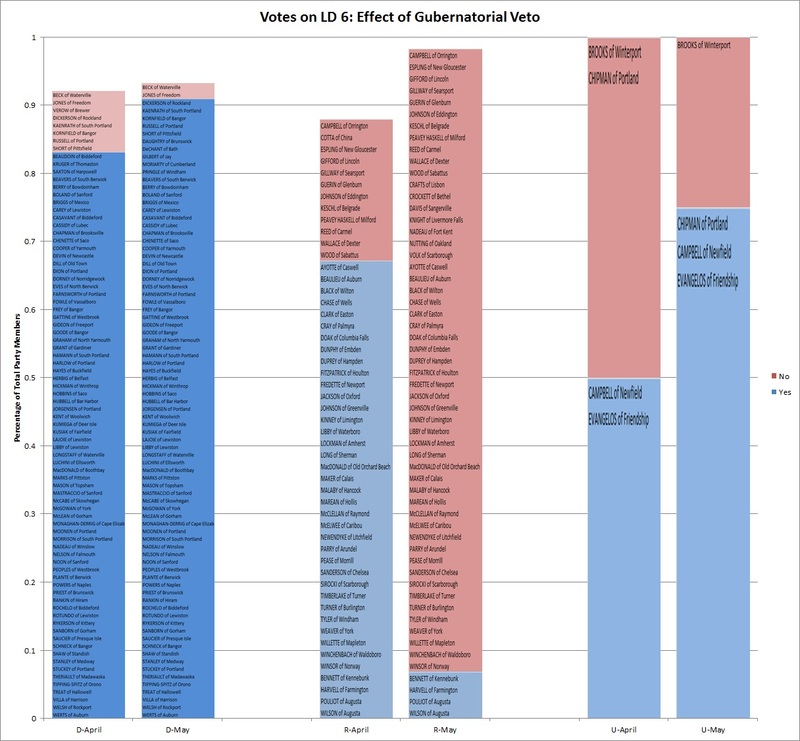 Here’s one simple way to visually explore vote-changing by party. It’s easy to understand, but there’s not a lot of detailed information in it. I converted the number of yes and no votes to percentages of total party members in order to compare trends by party. There are more Democrats than Republicans in the House, so if you don’t do this it makes it harder to compare party trends. However, this visual misses some of the relevant information. Especially if you’re the Press Herald, you want to be sure to get legislator’s names in there somehow, so people can know how their own legislators voted and whether they changed, or didn’t change, their vote. Here, and at the top of the page, my attempt at conveying that information. Click on the chart to be able to read the names. Maybe a little closer? Not sure. What ideas do you have for communicating visually about vote-switching? I’m the content producer who put together the pre-/post-veto “VoteTrac” presentations for the Press Herald. I completely agree that it would have been better to present both votes on a single screen, side by side, and I actually spent several hours on Tuesday trying to code a solution that would have done just that (my thought was to mark the flip-flopping lawmakers with an asterisk). Unfortunately, programming on a deadline has a way of forcing pragmatism with these things. This is an automated visualization that presents the vote results automatically with a PHP call to a MySQL database. Most of the hard work of coding it was done by my colleague Ted Andrick, and this was only the second time we’ve used it (the first was for the Legislature’s vote on whether to keep concealed-weapons permit data public). For the time being, it’s still best-suited to presenting the results of a single vote. But as we build a library of more roll call results in our database, we hope to write additional PHP scripts that can present the data in more sophisticated ways like the ones you suggest. For instance, I’m keen to build one that shows voting patterns geographically, as a map overlay. So please stay tuned, and keep the suggestions coming. Thank you for coming and commenting and I’m so glad you took my post in the spirit in which it was intended. I’m so glad the Press Herald is putting more resources into visualization work – it’s a style of communication that’s ideal both for the online environment and for translating online to offline. I also issue a hearty vote for more maps! There’s no more interesting way to talk about our state than spatially, I think. When I get a free moment, I’m going to look into putting the school grades scores into a state map format because I think that will also be very interesting.